Viola M. Tramontin (Meyers) 97 of Fair Lawn, NJ passed away on Saturday July 14, 2018. Born and raised in Wallington, NJ she resided in Clifton prior to settling in Fair Lawn 48 years ago. Viola was a member of the Fair Lawn Senior Center in Fair Lawn for many years. She was recruited as a pitcher to play for the All-American Woman’s Professional Baseball League during World War II. 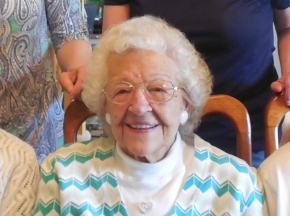 An avid golfer, she enjoyed bowling, dancing and singing. Viola will be missed by all who loved her. Prior to retiring in 1968, she was employed with Dumont Television in Clifton, NJ for 25 years. Beloved wife of the late Julius Tramontin. Loving and devoted mother of Lois Martini and husband Fred. Cherished grandmother of Lori Salvatore and husband Gerry. Adored great grandmother of Amanda, Emily and Matthew Salvatore. Dear sister of Adele Teasdale, Phyllis Trosky and the late Harold, William and Charles Meyers, Robert, Russell and Thomas Langill, Caroline Coronado, Marjorie Saykanics and Dorothy Presti. The family will receive relatives and friends on Saturday, July 28, 2018 10 - 11 AM with a service to follow at Vander Plaat-Caggiano Funeral Home Inc., 13-31 Saddle River Road, Fair Lawn, NJ 07410 201-797-3500. Rest in peace Aunt Lola.You were the best godmother. in the world and will be missed by all . You will be so missed Aunt Lola. I will miss talking to you and hearing about all the family stories and memories. Anytime anyone wanted to know anything about the family my dad always said ask Aunt Lola and you always knew the answer! You will be missed Aunt Lola! You shared many family memories and stories.